Eastern Washington’s smothering defense was a big reason the Eagles earned a share of the Big Sky Conference title. Jay-Tee Tiuli was a big reason EWU yielded only 16.8 points a game in conference play. The 6-foot-4, 315-pound nose tackle was named the Big Sky’s Defensive Player of the Year on Tuesday, becoming the first EWU player to earn the honor since linebacker J.C. Sherritt in 2010. Tiuli, who often fought through double-teams at the line of scrimmage, had 29 tackles, 6.5 tackles for a loss and four sacks during the season. The Federal Way, Washington, product was a first-team all-Big Sky selection in 2016, but missed 2017 with a shoulder injury. UC Davis quarterback Jake Maier (Offensive Player of the Year), Montana quarterback Dalton Sneed (Newcomer of the Year) and Weber State running back Josh Davis (Freshman of the Year) also headline the all-conference selections. 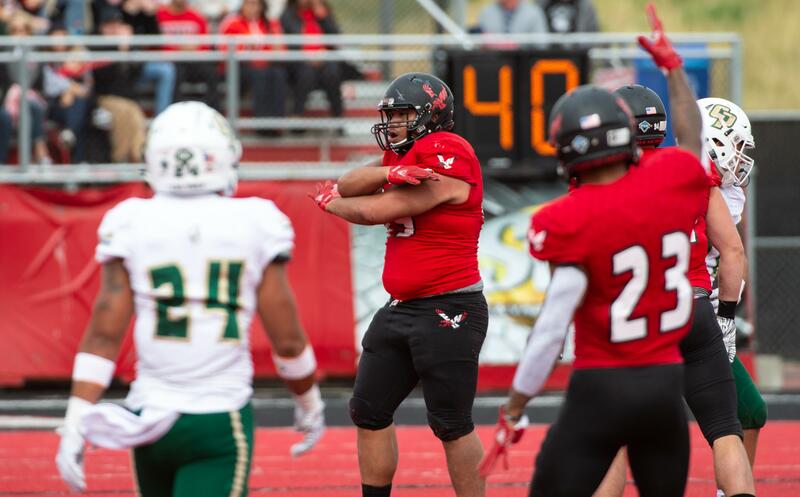 EWU (9-2) had 21 players earn All-Big Sky distinction, including four on the first team – Tiuli, defensive end and Cheney High product Keenan Williams, wide receiver Nsimba Webster and kicker/punter Roldan Alcobendas. Williams, who missed two games earlier in this season with an injury, had 26 tackles, five tackles for a loss and a sack. Webster hauled in 60 passes for 1,021 yards and six touchdowns for an offense that ranks second in the FCS (553.2 yards per game). A first-team kicker and punter, Alcobendas was 13 for 13 on field goals and hit all 54 of his extra-point attempts during the regular season. His punts averaged just less than 46 yards an attempt, with 16 of his 37 inside the 20-yard line. Idaho, which finished its season 4-7, had eight players recognized, three on the first team – linebacker Kaden Elliss, offensive tackle Noah Johnson and punter Cade Coffey. EWU earned a No. 3 seed and a first-round bye in the FCS playoffs, and will host either Nicholls State (8-3) or San Diego (9-2) on Dec. 1 at 2 p.m. at Roos Field. Published: Nov. 20, 2018, 1:17 p.m. Updated: Nov. 20, 2018, 8:40 p.m.